and all the other types—exempt newspaper type—on short notice and in a style that cannot be surpassed. Ladies and gentlemen are respectfully invited to call. 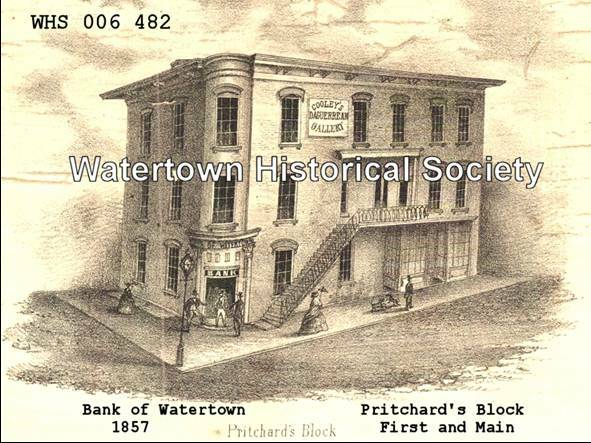 The subscriber wishing to close up business in Watertown by the 1st of October (or sooner) would respectfully invite all who are desirous of having pictures taken to give him an early call. Prices lower than ever, and satisfaction is given in all cases. The subscribers have removed to the rooms formerly occupied by D. Wing, over the Post Office, and are now ready to furnish the citizens of Watertown and surrounding country with as good photographs or ambrotypes as are made anywhere and at as low prices. Daguerreotypes enlarged to any size by the photographic process. Ladies and gentlemen are invited to call and examine some fine photographic views of Madison. Rooms open from 8 to 12 o’clock a.m. and from 1 to 5 o’clock p.m.
S. E. Curtiss, Photographic Artist. Where pictures can be had from a miniature to that of a life-like size in all the various styles of the art. Citizens and the public generally are invited to call and examine his specimens as the subscriber is aware that all puffing is superfluous. The picture is the thing—which can be procured with all the truthfulness of life, at Curtiss’ Fine Art Gallery. Prices varying from 25 cents and upwards. Particular attention paid to copying and enlarging from daguerreotypes. CURTISS’ FINE ART GALLERY is a good place to get pictures. N. S. Curtiss and H. Dennisson [Denniston, Harda ? ], two experienced and accomplished artists, have been operating here during the past few weeks and produced some as fine photographs, ambrotypes and fereotypes as we have ever seen. Now is the time to get likenesses that are both beautiful, true and cheap. Mr. S. E. Curtiss has recently established a branch gallery at Waterloo, where the people of that thriving village can get first class pictures on their own terms and after their own taste. (Successor to C. R. Cooley) Where pictures can be had from a miniature to that of a life-like size in all the various styles of the art. Miniature Photographs—S. E. Curtiss, a skillful Daguerrian artist, is now taking all varieties of likenesses, and among others, miniature photographs for cards, letters, presents or any use which the getting of such pleasing souvenirs may make of them. He gives 24 of these exquisite and life-like miniatures for a dollar. Those who wish to obtain these fashionable and sun-sketched shadows of themselves, to leave with their friends, have the best opportunity to do so. Mr. Curtiss never fails to furnish a true, fine and finished picture, no matter what its size, kind or style. Curtiss Art Gallery — We call public attention to the card of Mr. N. S.[?] Curtiss, an accomplished artist in this city. His pictures, of every variety, are always beautiful and life-like and give entire satisfaction to those who visit his rooms and sit for them. He has a variety of Photographic Albums, which are as cheap as can be found anywhere. He has also a large number of engraved portraits of the most distinguished army officers, which he sells on the most favorable terms. One of the best and most faithful likenesses of Douglas that ever has been taken may also be obtained of him. Opposition is the life of business. The two Daguerrean Artists in this city have been “running” each other for the last few days. Times were dull and a little excitement was necessary. One came down a little, then the other fell still lower in the price, until both got down to ten cents a picture, and since then both rooms have been crowded; every thing goes off lively, and dimes are changing hands rapidly. S. E. Curtiss, Photographic Artist, would respectfully tender his thanks to the citizens of Watertown for the liberal patronage received from them during his short residence in this city. Not feeling inclined to boast of the merits of his work, as is the manner of some, he is willing to submit it to the test of a discerning public who have had and still are having many pictures from his rooms and of his own taking. Having occasion to be absent for four weeks, he has employed C. R. Cooley, to take charge of the rooms during his absence and if any are told that the rooms are shut up he hopes that it will not be credited until they find it so, as they will always be open from half-past 7 in the morning until 6 at evening, Sundays excepted—the assertion of a certain individual to the contrary notwithstanding.
. . . Rooms over Fountain’s Store, near the bridge, on Main Street.